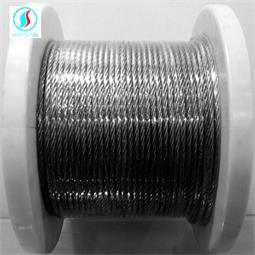 Galvanized steel wire ropes are divided into two categories: cold galvanized steel wire ropes and hot-dip galvanized steel wire ropes. Hot-dip galvanizing and cold-galvanizing have this essential difference in the process. Hot-dip galvanizing is the formation of a coating by physical thermal diffusion. First, an iron-zinc compound is formed, and a pure zinc layer is formed on the surface of the iron-zinc compound. The highest amount of zinc on hot-dip galvanizing is only 593g/m2. Hot-dip galvanizing will reduce the mechanical properties of steel wire, and require high-strength and high-corrosion galvanized steel wire rope, which is mostly made of electro-galvanized steel wire. Hot-dip galvanizing is zinc plated in a molten zinc bath at 450-480 degrees. 1x7,1X12, 1x19, 1*37, 3*7,6*7, 7*7, 6x7+FC, 6x19+FC, 7x19,19X7, 6*25fi+FC,6x12+7FC, 6*15+7FC, 6x27+7FC, 6*36+FC, 6*37, 18*7, 8*19, 4X31SW+FC 4X25Fi+FC 6X19W+IWS 6X19S+IWS 1X19W etc. It can be used in high-rise buildings, vehicle and ship bundling, traction, strapping, etc., for shipping, offshore oil exploration, aircraft handling, and marine fishing, trawling, fixed netting, and reeling. Due to the unique properties of steel wire ropes, no more ideal products have been found at home and abroad to replace steel wire ropes in a comprehensive or one field. Therefore, wire ropes have become the fields of metallurgy, mining, oil and gas drilling, machinery, chemical engineering, aerospace and other fields. 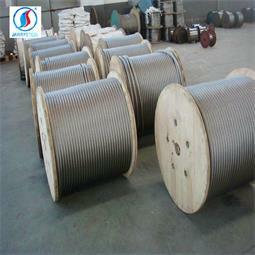 Indispensable parts or materials, the quality of which has also been concerned by many domestic industries, and invested a lot of manpower and material resources for wire rope use research and product development work, the choice of wire rope structure, daily use, maintenance, replacement and scrapping, etc. A number of procedures and rules have been developed.